Grades can of course be limited to CDL values or exported as 3D LUTs for standard cross-platform workflows, but you don't need to be constrained by the lowest common denominator. All shots can have full sophisticated Baselight looks-authored and applied using the same compact grading interface familiar to users of Baselight Editions for Avid, FCP and NUKE. Daylight is available for purchase or quarterly rental, and the freelance licence option allows the licence to be moved from machine to machine using a simple, web-based authentication scheme. The software will run on any Mac system equipped with OSX 10.9 or above. 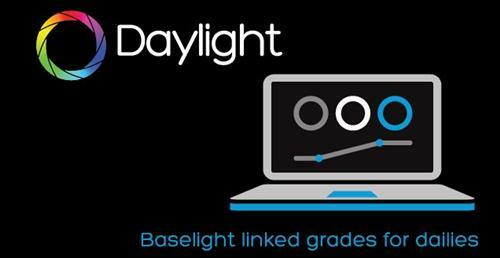 Using the same philosophy as Baselight Editions, Daylight uses whatever graphics card is installed without the need for special, CUDA-capable variants. Daylight provides comprehensive end-to-end handling of metadata. The system reads all the data it can from the headers of your camera and audio files and displays relevant metadata fields in the Sequence Browser and the Shots View-and you can also choose to display information on thumbnails in the Scene and Galleries.